Let’s talk about a mini makeover that involved a whole lot of hiccups. 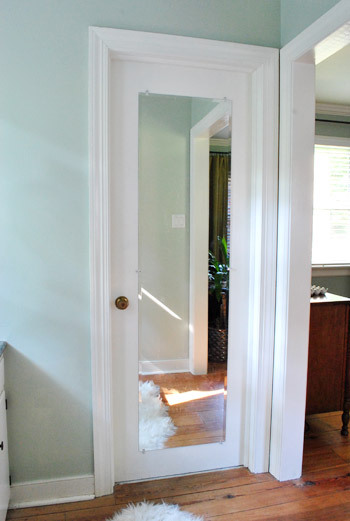 It was alllllll the way back in January that we decided that this mirror on our master bathroom door could stay (unlike the one on our guest bathroom door, which got the heave-ho since the person on the toilet could see THEIR ENTIRE BODY in it). But we figured the bedroom mirror could stay (since it doesn’t force you to stare at your reflection while on the porcelain throne) on the condition that we’d create a thicker frame around it to give it more presence so it looked less like one of those big flimsy $5 mirrors that you bring to college. Not that there’s anything wrong with those (we were both very happy to cart them off to school), but we like to think we’ve since graduated from that look. But yeah, even though this plan was hatched in January, it has taken us until September to actually do it. Oops. We’re glad we kept it, since it has been very functional (double-checking outfits, fixing hair, flexing – you know, the usual) but the basic plastic clips weren’t much to look at. 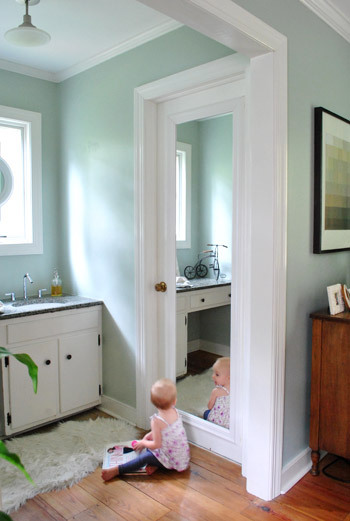 Having seen lots of other bloggers upgrade their mirrors with trim (like Layla & Kevin, for example) we were confident that it’d be a pretty easy task (FYI, this is what I like to call “foreshadowing”). 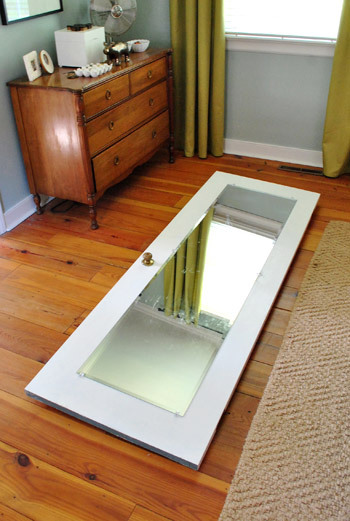 First I took the door of its hinges so I could work with it laying flat. 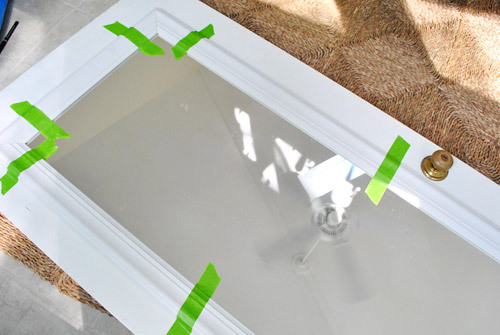 The basic plan was: remove mirror, reattached with glue (so plastic clips wouldn’t be in the way of trim), cut molding with miter saw, and glue to door around mirror. Simple, right? 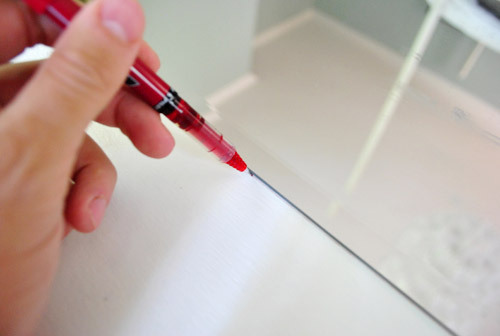 Before removing the mirror I traced the outline with a red pen so we would be sure to glue it back on in the right spot. I didn’t care about marking the door since this part would eventually be covered by trim. With the clips unscrewed and removed, the mirror came off no problem (though part of me secretly hoped it had already been glued in place). 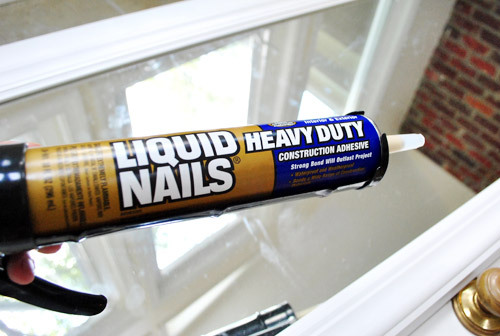 We picked up this Liquid Nails Mirror Adhesive at Lowe’s for about $5. 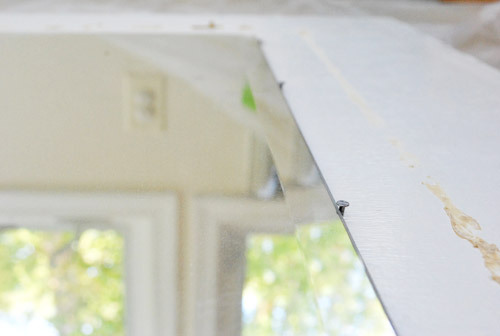 It’s apparently designed not to damage the reflective coating on the back of the mirror (which is why we used it over other adhesives, which could cause visible-through-the-mirror marks over time). 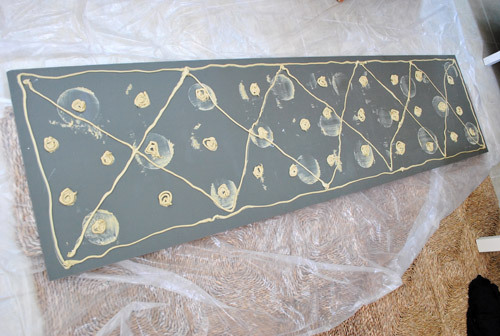 Oh but before we used it we sanded the back of the door where the mirror would be glued (since it recommended doing that to rough things up before gluing any painted surface). 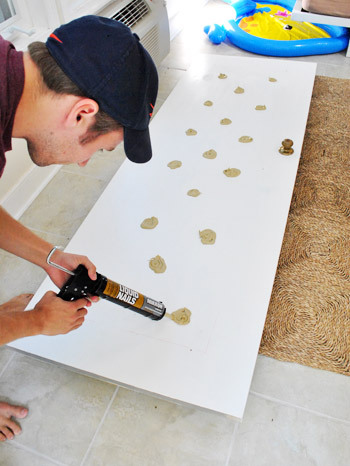 Since it was kinda stinky, we moved our mirror-gluing operation into the sunroom where I happily got to squirting blobs of adhesive as I remembered the instructions suggested (hint: more foreshadowing). 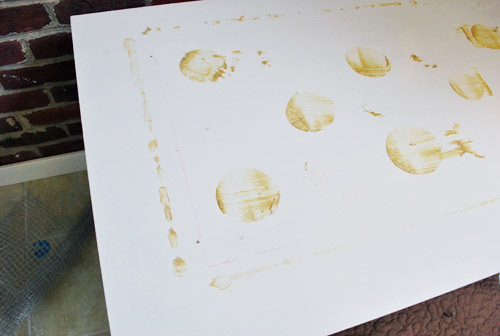 With Sherry’s help, we put the mirror in place, pressed it down and left it alone to dry for 72 hours. At Lowe’s we also picked up some trim that looked made for this job (though I think it’s actually meant for the top of beadboard). 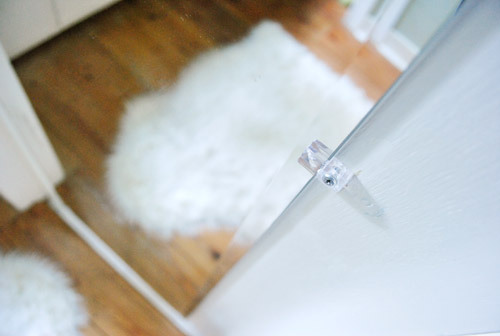 The groove in it was perfect for laying flat over the edge of the mirror. Well, long story short, after measuring and cutting all of the pieces (and just moments before gluing it down) we stepped back and realized it really wasn’t much of an upgrade. At all. It just looked even more like one of those cheap $5 college mirrors. Oh, accidental regression – I love how you sneak up on us. So with about $10 in trim down the drain, I went back to Lowe’s and found some heftier stuff that still sported enough of a lip to sit nicely over the edge of the mirror. 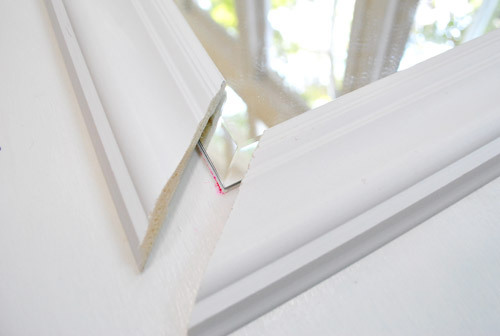 Instead of about an inch and a quarter of width, this trim was nearly three inches wide. 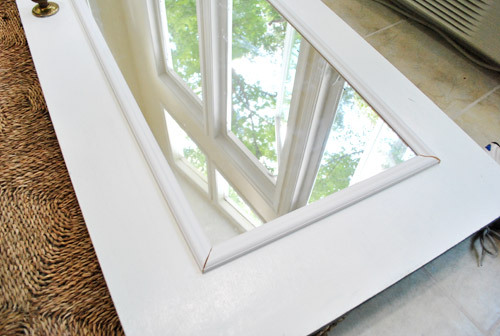 We landed on that size because anything thicker would potentially run into the doorknob, but it was almost twice as thick as the too-thin trim that we tried first. 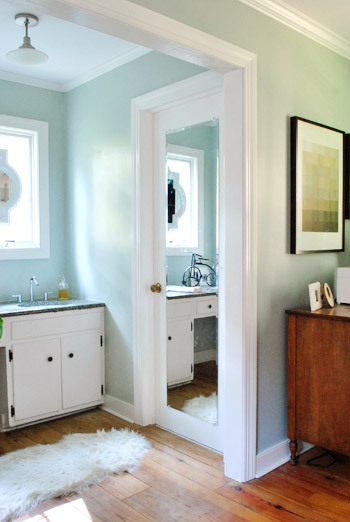 We obviously wanted the mitered corners to match up with the beveled corner of the mirror. So to help me find my cut lines, I placed a piece of painter’s tape along the line of the bevel to effectively “extend” my corner. Then I marked where I wanted to make my 45-degree cuts using my miter saw. 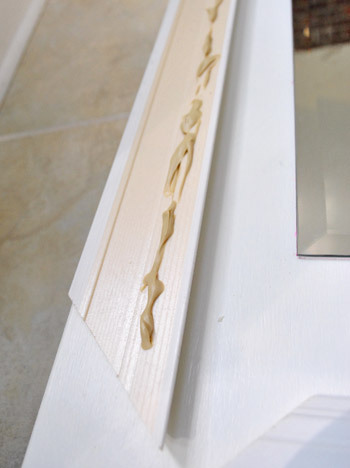 …and then broke out some heavy duty Liquid Nails to glue all of the trim in place. Normally I prefer nails or screws over glue, but I went out of my comfort zone on this one since screwing or nailing next to a mirror made me nervous and everything on the Liquid Nails tube insinuated that it could handle the job. 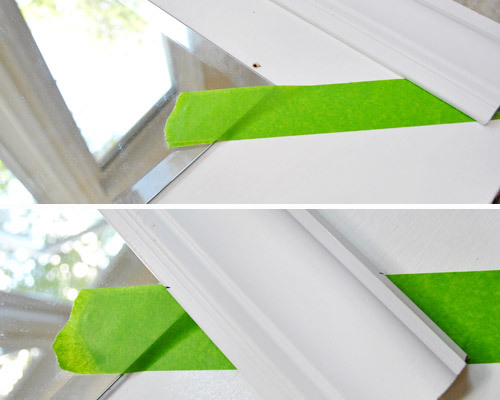 I squirted out a thin line of adhesive on each piece of trim (on the side that would sit against the door, not the mirror) and carefully laid all four pieces in place. Just to be sure nothing shifted during drying, I taped each piece down. Can’t be too careful, right? Well apparently I could’ve been more careful. After letting the trim dry for a day (the mirror had set for 72 hours at this point), I eagerly reattached the door (keep in mind that we’d been living bathroom door-less for about four days thanks to the false start with the too-thin trim) and took a celebratory shower. Maybe it was the steam from the shower? 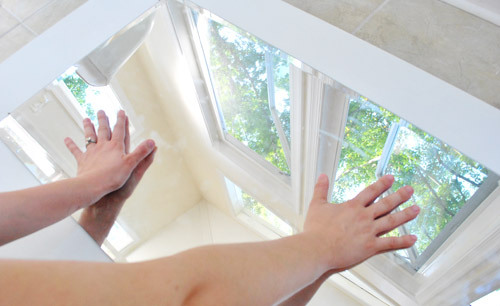 Maybe it was re-hanging the mirror too soon before things fully cured? 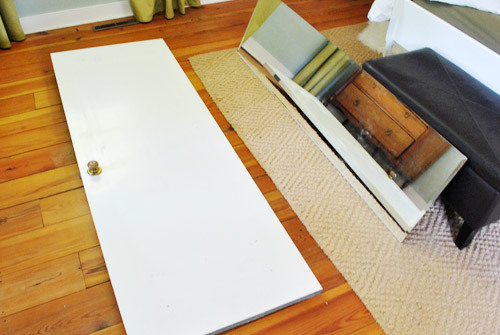 Whatever it was, moments after I finished get dressed after my shower – the mirror slid off the door, busting off the bottom piece of trim in the process. The other three pieces stayed in place, which thankfully kept the mirror from toppling over onto the floor. So the only damage to the mirror was a chipped corner that would be covered by trim anyway. But Sherry and I did nearly hyperventilate when we heard a crash from the bedroom and ran in to see what happened. I didn’t take many pics of the “aftermath” because I was kinda grumpy about the whole thing. Not only did I have to redo everything (including having to scrape off all of the old glue), but I wasn’t quite sure where I had gone wrong. 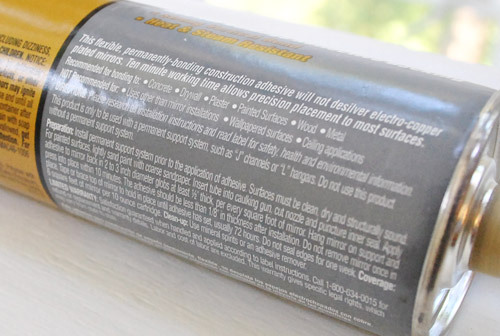 Well, re-reading the directions on the back of the mirror adhesive offered some clues. Like “Do not use this product without a permanent support system. ” Oops. 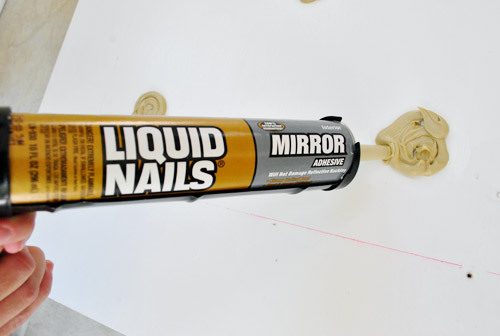 Plus some parts about letting the glue set for a full week and applying it to the mirror back, not the door (though I doubt that second tip made much of a difference since it gets on both surfaces when you mash them together) might have come into play too. So in doing this a second time, I was determined to follow the directions. 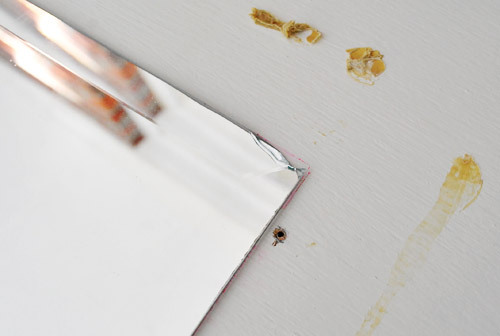 This time the adhesive was applied to the mirror… generously but in less large globs (Sherry called the first ones “cookie sized” but I’d describe these more as golf-ball-sized (and not as thick, so it could cure more easily). In addition to the blobs described in the directions, I criss-crossed some lines too, just to be safe a crazed man who couldn’t handle another mirror failure. As for a permanent support solution, I wasn’t about to re-install the clips since the point of this whole glue/framing method was to avoid them (and the trim wouldn’t look great with big lumpy clips under it). So I improvised and carefully added some small finishing nails around the edges of the mirror. 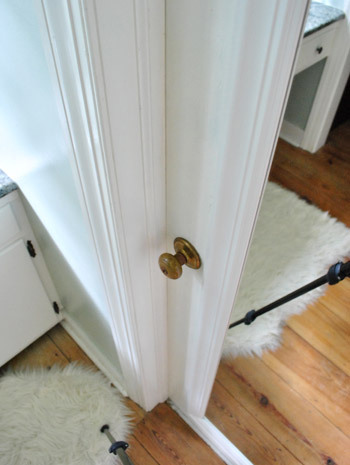 They went into the door nice and solidly, and the head provides a nice little rest/stop for the mirror. They might not work as a support solution all on their own (if there weren’t trim and glue also coming into play) but I was banking on them being enough to keep it from sliding as easily as it did after just two days of setting without any other support going on. So with the mirror re-glued and nailed in place, Sherry and I started to countdown SEVEN FULL DAYS of letting the glue set. Even though it meant a full week of a door-less master bathroom, it felt like a necessary sacrifice if I didn’t want to do this a third time. And that’s how Captain Careful rolls. After all of the trouble that went into the project, I’ll admit that it doesn’t feel like the biggest and most life-changing payoff, but it’s definitely an upgrade. 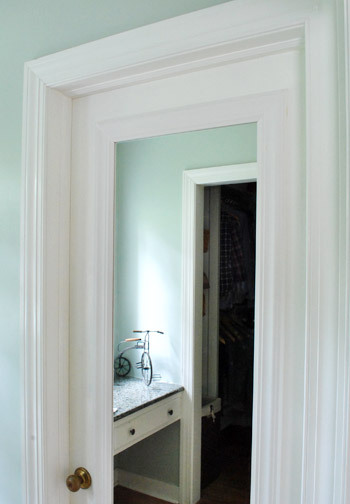 The white trim on white door doesn’t really “pop” in photos, but in person it’s a nice layered architectural detail that ties into the big quatrefoil mirror that we hung in front of the nearby over-the-sink window. And the goal of this project was just to finish the raw mirror edges more nicely, not draw lots of attention to it or anything (so painting it a color would just make it compete with other things like the mirror over the sink which, no offense to our newly trimmed fella, is much more interesting). So we’re kinda glad this update is of the subtle variety. More than anything, I’m just glad to have the project successfully completed, to have some privacy returned to our bathroom and to no longer have to stare at those clear plastic mirror clips. Yep, now we can stare at more important things… like the doorknob that needs updating (probably with a can of ORB since my wife is so smitten). 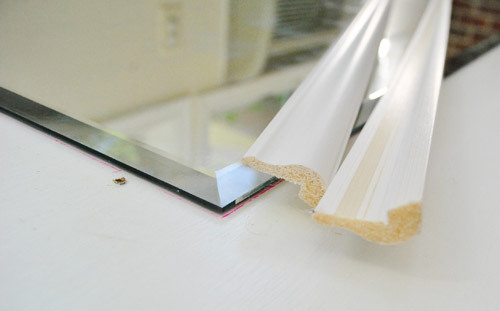 As for the total cost, the second batch of thicker trim was $12, so the entire cost of the project with mirror adhesive should be around $17 if you don’t mess up and buy ten bucks worth of too-thin trim (which we hope to repurpose someday in some capacity…). 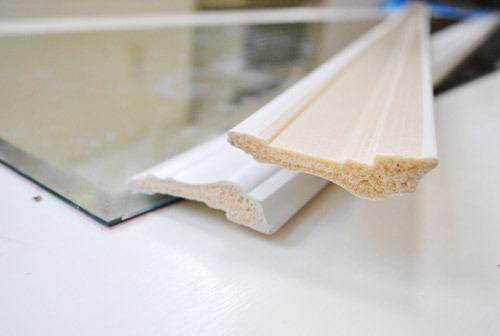 Update: we just learned that Lowe’s & Home Depot will take trim back (even if it has been cut, as long as it’s over 12″). So here’s hoping we can recoup the $10 that we spent on that too-thin trim.